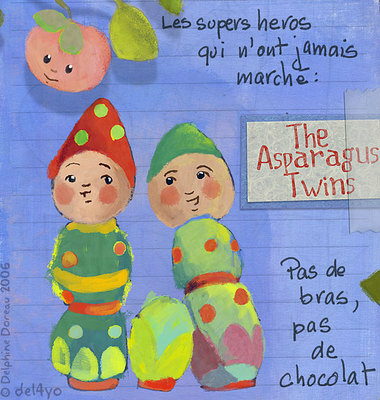 Who never get a chance to do it: the asparagus twins . We have kind of a teasing quote in France : "No arms, no chocolate" meaning it's difficult to grab chocolate without arms or hands. Not the funniest thing ever but we never lose an occasion to use it. I know, teasing is mean. Aller hop, puisque vous avez ete sages, envore un bout de l'image oubliee. Je me suis inspiree de poupees Kokeshi que je trouvais trop crognotes, en forme de pousses de bambou. What can you see at the end of your street?